Synthetic peptide corresponding to Rat ERK1 + ERK2 aa 324-345. ICC/IF: U-87 MG (human glioblastoma-astrocytoma epithelial cell line) cells. IHC-P: Human breast carcinoma tissue. Mouse stomach tissue. Human cortex tissue. WB: Recombinant human ERK1 protein (ab116536), Human granulosa cell line whole cell lysate. Our Abpromise guarantee covers the use of ab54230 in the following tested applications. WB Use a concentration of 1 µg/ml. Predicted molecular weight: 44 kDa. IHC-P 1/10 - 1/100. Perform heat mediated antigen retrieval before commencing with IHC staining protocol. Immunocytochemistry/ Immunofluorescence analysis of ERK1 + ERK2 Antibody (ab54230) was done on 70% confluent log phase U87-MG cells. The cells were fixed with 4% paraformaldehyde for 15 minutes, permeabilized with 0.25% Triton™ X-100 for 10 minutes, and blocked with 5% BSA for 1 hour at room temperature. 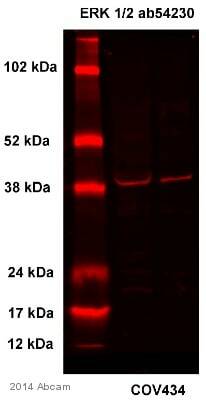 The cells were labeled with ERK1 + ERK2 Antibody [ERK-7D8] (ab54230) at 1µg/mL in 1% BSA and incubated for 3 hours at room temperature and then labeled with Alexa Flour 488® Rabbit Anti-Mouse IgG Secondary Antibody at a dilution of 1/400 for 45 minutes at room temperature (Panel a: green). Nuclei (Panel b: blue) were stained with DAPI. F-actin (Panel c: red) was stained with Alexa Fluor 594® Phalloidin. Panel d is a merged image showing cytoplasmic and nuclear localization. Panel e is a no primary antibody control. The images were captured at 40X magnification. Immunohistochemistry (Formalin/PFA-fixed paraffin-embedded sections) analysis of human breast carcinoma tissue labeling ERK1 + ERK2 with ab54230. Staining in the cytoplasm and nucleus (right), compared to a negative control without primary antibody (left). To expose target proteins, antigen retrieval was performed using 10mM sodium citrate (pH 6.0), microwaved for 8-15 min. Following antigen retrieval, tissues were blocked in 3% H2O2-methanol for 15 min at room temperature, washed with ddH2O and PBS, and then probed with a ERK1/2 monoclonal antibody (ab54230) diluted in 3% BSA-PBS at a dilution of 1/50 overnight at 4°C in a humidified chamber. Tissues were washed extensively in PBST and detection was performed using an HRP-conjugated secondary antibody followed by colorimetric detection using a DAB kit. Tissues were counterstained with hematoxylin and dehydrated with ethanol and xylene to prep for mounting. Immunohistochemistry (Formalin/PFA-fixed paraffin-embedded sections) analysis of mouse stomach tissue labeling ERK1 + ERK2 with ab54230. Staining in the cytoplasm and nucleus (right) compared to a negative control without primary antibody (left). To expose target proteins, antigen retrieval was performed using 10mM sodium citrate (pH 6.0), microwaved for 8-15 min. Following antigen retrieval, tissues were blocked in 3% H2O2 -methanol for 15 min at room temperature, washed with ddH2O and PBS, and then probed with a ERK1/2 monoclonal antibody (ab54230) diluted in 3% BSA-PBS at a dilution of 1/20 overnight at 4°C in a humidified chamber. Tissues were washed extensively in PBST and detection was performed using an HRP-conjugated secondary antibody followed by colorimetric detection using a DAB kit. Tissues were counterstained with hematoxylin and dehydrated with ethanol and xylene to prep for mounting. Immunohistochemistry (Formalin/PFA-fixed paraffin-embedded sections) analysis of human cortex tissue labeling ERK1 + ERK2 with ab54230. Publishing research using ab54230? Please let us know so that we can cite the reference in this datasheet.